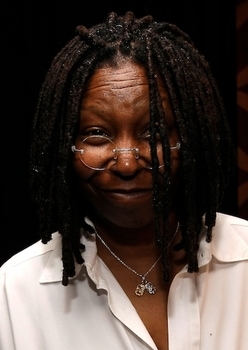 Whoopi Goldberg is wearing the Dramedy Pendant by Ziamond Cubic Zirconia CZ Jewelers. The Dramedy Pendant features a comedy mask in 14k yellow gold adorned with canary colored pave set cubic zirconia cz and a tragedy mask in 14k white gold with diamond colored pave set cubic zirconia cz. All Ziamond cubic zirconia cz jewelry is set in 14k gold, 18k gold or platinum.